That is all from me. However, there are two places you can head to stay across the day's remaining football action. It is currently Stoke 0-0 Arsenal, which you can follow here. And Real Madrid lead 5-1 against Sporting Gijon, which is here. A good evening to you all. As you can see from the graphic below, United's goal wasn't cunningly crafted. What you can't tell is that it was a cracking finish by Wayne Rooney (10), who hooked the ball into the roof of the net after Marouane Fellaini's header had hot the bar. Louis van Gaal talking to BBC Sport: "We have survived the first-half, we didn’t keep the ball to much and they pressed and pressured. But in the second-half we came into the match and kept the ball more and created chances and scored the winning goal, I’m happy, the players are happy and the fans more happy. “We know Wayne Rooney has played for Everton and now plays for United so he wants to score against Liverpool, it means a lot for him. “The goal came from the first indirect corner and we ask for that as it always more dangerous. The ball from Mata was perfect, as was the header from Fellaini, but he didn't have the luck that Wayne does. Wayne Rooney (176 goals for Man Utd) has overtaken Thierry Henry (175 for Arsenal) for the most goals for a single club in Premier League history. Rooney has now scored in four successive games for Manchester United for the first time since March 2012. It was Rooney’s first Premier League goal at Anfield for United since January 2005. Liverpool have conceded more goals from corners than any other team in the Premier League this season (7). Liverpool have now lost 12 times against United in the Premier League era, more defeats than against any other visitors. Liverpool’s failure to score ended an eight-game Premier League run of scoring at Anfield. It is the first time under Klopp they hadn’t scored at home. Louis Van Gaal has won all four Premier League games against Liverpool as United boss. Liverpool manager Jurgen Klopp talking to BBC Sport: "I didn't see too many chances for Manchester United and we didn't take ours. Of course it is frustrating. We lost a game that we should not have lost. "The goal was to defend and we didn't do it. That is our responsibility. We have to defend set pieces better. "We did really well creating the chances, but there were a lot of situation where we could have created more chances and didn't. There were a lot of things but we lost in a derby against Manchester United so I can't be very positive at this moment so soon after the game." Manchester United manager Louis Van Gaal speaking to Sky Sports: "When you beat Liverpool, it is good for the fans and for the table as our competitors also lose points, it is a big step in a good direction and I am very happy. “In the first-half we didn’t keep the ball and we have survived the first-half. In the second-half we played much better and kept the ball better and created chances and Wayne Rooney makes the fantastic goal again. “I don’t think David de Gea has done very much, two or three balls he has to stop, a goalkeeper has to do that. He is playing very good but you can not say he was a fantastic, marvelous goalkeeper today. Manchester United's Liverpool-born matchwinner Wayne Rooney talking to BBC Sport: "This is a special feeling, obviously. It is always great to score at your rivals and, against Liverpool for this football club, it is a massive result. On a personal note it doesn't get much better. "For my goal, I know Simon Mignolet is a very good goalkeeper and there were players trying to cover so I just tried to put my foot through it and take whoever was in the way with it! Thankfully it went in and won us the game. "Today the performance wasn't that important - the result was all that mattered." We have live coverage of Arsenal's trip to Stoke on 5 live with commentary from Alan Green and former Leicester midfielder Robbie Savage. Fair play to Michael Carrick. I salute this kind of behaviour from players. Manchester United matchwinner Wayne Rooney on Sky Sports: "Everyone knows the importance of this game - regardless of league positions, it is a massive football game and it is a great victory. We needed the three points and to continue the start to this year, so it is a massive win for us." On setting a new record for Premier League goals scored at one club: "I didn't know! It is great to have records but scoring a winning goal at Anfield, it's been a long time since that happened for me, so I will be a bit selfish today and enjoy that one." Alternatively, there is Stoke v Arsenal, which kicks off in about five minutes time and can be found here. We only had one goal at Anfield, but over in Madrid Real have bagged five in the first half. Not a bad home managerial debut from Zinedine Zidane so far. If I was the Sporting Gijon manager I'd have switched the computer off without saving long ago. "Manchester United win 1-0. Dreadful game with little quality - but who can blame United and Louis van Gaal for taking that all day long at Anfield? " You can't grumble at a 100% conversion rate. United have been Jonny Wilkinson-esque against Liverpool this season. Scott Wilcox: Absolute steal of a win. #LFC by far the better team but somehow United got a result. Nathan J. Pedersen: Im confused - horrible football but United still won. Do I want Van Gaal gone or not? Sam: Got big Dave to thank for that win, a couple of world class saves. 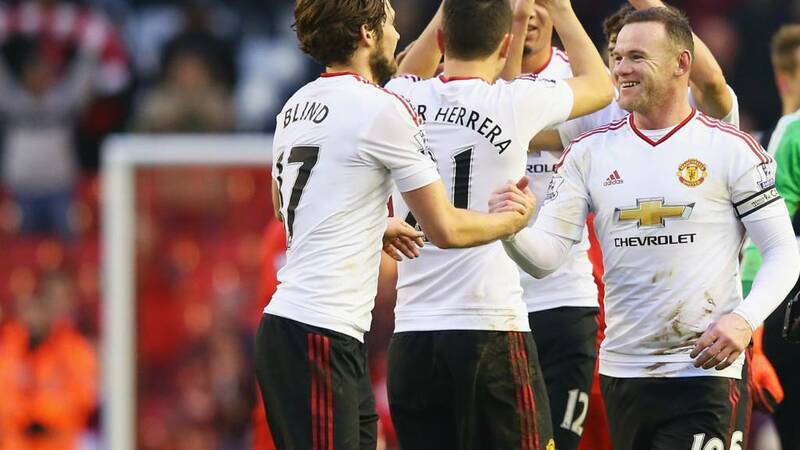 4/4 vs Liverpool for Van Gaal and a massive 3 points! Ashley Wilkinson: deserve little, if anything, from that, but displayed a killer instinct #LFC lack without Sturridge. Big summer for Klopp. Not that either the Liverpool or United fans will need reminding of this but today's win seals a double for the Red Devils over their fierce rivals this season. United are fifth in the table, two points behind fourth-placed Tottenham. Liverpool's own top-four hopes suffer a big blow. They are eight points behind Spurs in ninth. "Yes the quality of the game was poor, but the work rate was fantastic, every player out there put everything into the game. Remember the quality falters when you have so many games in a short period. "In the end it was one bit of sharpness. The corner from the left-hand side was headed down onto the bar by Fellaini and the reaction from Wayne Rooney won the game."